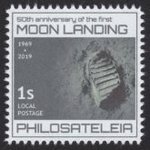 Beautiful stamp Roos!!! 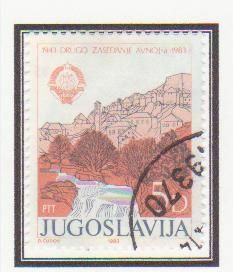 dang i like those Queen Elizabeth II stamps..
And again on a 1983 stamp commemorating the 40th anniversary of a meeting at Jajce of the Anti Fascist Front which withdrew support from the monarchist Government in Exile. 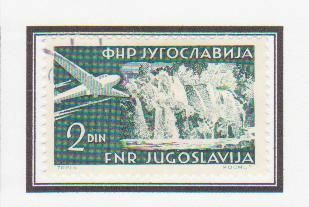 And again on a 1977 Yugoslav stamp marking Environment Dat - hence the huge robin! 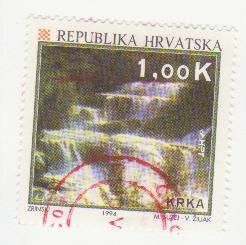 Waterfall at Krka National Park, Croatia on a 1994 Tourism stamp of Croatia. 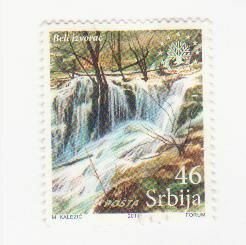 Waterfall in the Beli Izvorac nature reserve, near the Danube, on a 2011 stamp of Serbia. This is a good resource for this topical. Godafoss on an Iceland 1956 stamp. Godafoss means "Waterfall of the gods". In about the year 1000 the Icelandic assembly, the Althing, agreed that Christianity should become the official religion of the country. The tradition goes that after this, statues of the pagan gods were thrown into this waterfall. 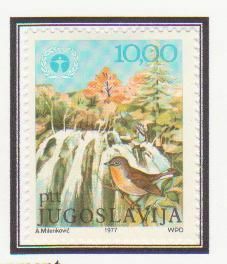 Another waterfall, Dettifoss, on an Icelandic 1956 stamp. It is probably the most powerful waterfall in Europe. What struck me, though, when I saw it on a hiking trip was the colour of the water: it is on a river containing a lot of material from one of the icecaps, and is heavily discoloured as a result. 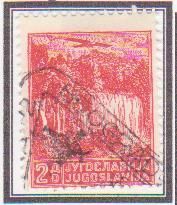 Skogafoss on a 1956 Iceland stamp. Formerly it was on the edge of sea cliffs, but, due to the coastline changing, it is now on a line of cliffs some 3 miles inland. The waterfall featured in a film version of The Secret Life of Walter Mitty. 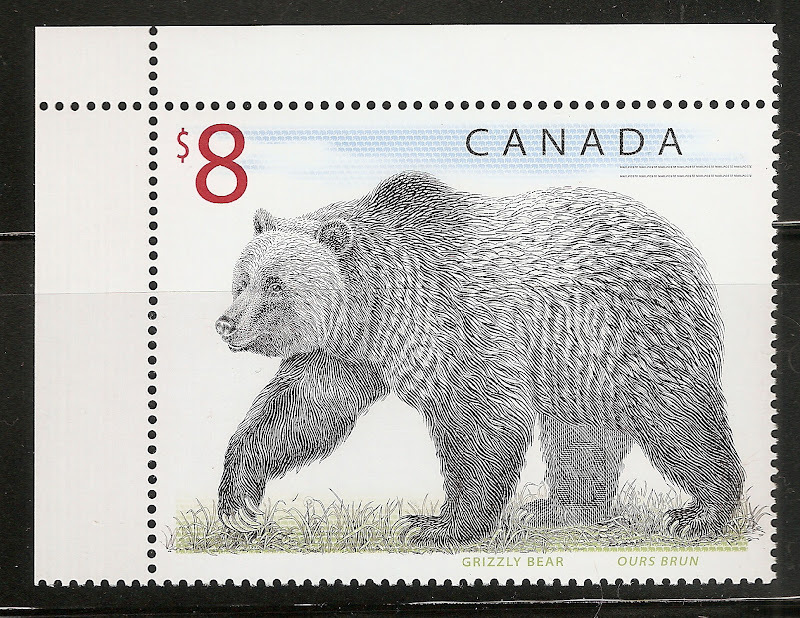 Gullfoss - meaning "the golden falls" - appears on a fourth 1956 Iceland stamp. On a hiking trip the party I was in camped for a night very near the top of the waterfall. It was not a recipe for a good night's sleep, because of the noise, and also the effects on our bladders of hearing all that water falling! Gullfoss is on the itinerary of one of the most popular day trips from Reykjavik. Ofaerufoss in central Iceland on a 1977 Icelandic Europa stamp. The design shows a natural stone bridge above the waterfall: this collapsed in the early 1990s. 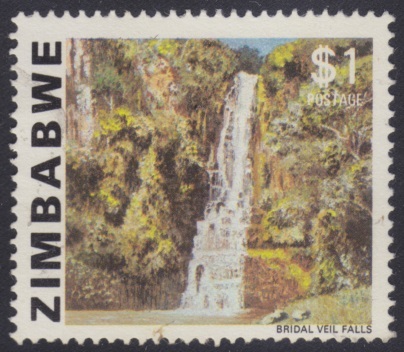 Bridal Veil Falls, Zimbabwe. 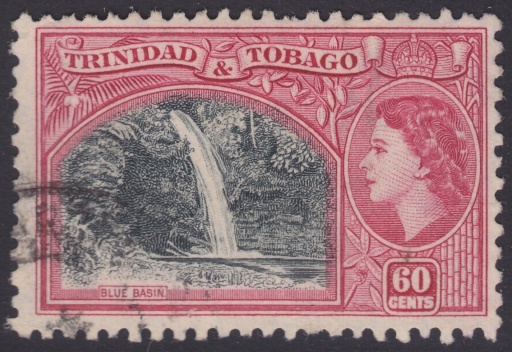 There are a few dozen other waterfalls around the world that share the same name.